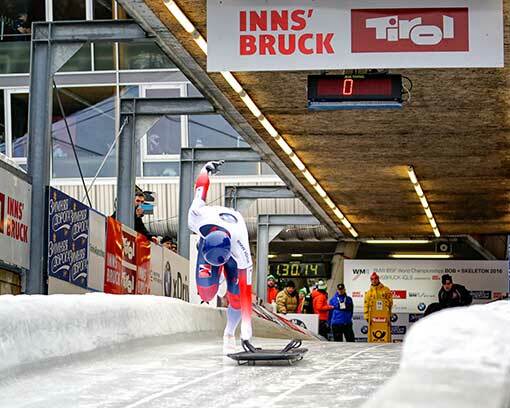 In a few days I’ll be on a plane with the British skeleton team on our way to start another season on ice. We’re starting in Norway this year, which has been a regular preseason venue for the British team in previous years, and fingers crossed after three weeks of throwing ourselves down the track in Lillehammer we’ll have regained some kind of competence in our adopted obsession. Our home for the next three weeks will be a small collection of wooden cabins which are brimming with shadows and murky corners. The sun has a very lackadaisical attitude towards rising in Norway at this time of year, and some mornings the darkness is so complete that my being dressed properly for the day is entirely based on luck. The days will be an abrupt return to the routines that we’ve successfully forgotten over the long and rainy summer at home: by the time we’ve added sliding, sled work, gym, video review, furtive eating, and physio treatments to the schedule it gets pretty bloated. Each day revolves almost exclusively around sliding, even at meal times I’ll have miniature sleds whizzing round corners in my head wondering where I can find more speed. It’s an enjoyable obsession though and it gives my life a purpose, even if it might seem a trivial one to some outside eyes.